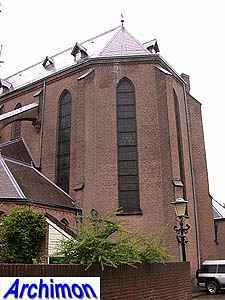 When at the end of the 16th century Alkmaar became officially a protestant city the catholics lost the right to use all of their churches. 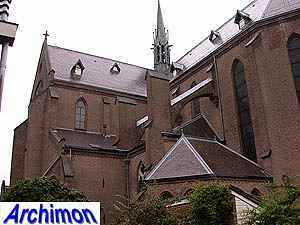 Instead they had to use clandestine churches. The religious tolerance towards catholics improved after an invasion by the French in 1672 had almost made an end to the protestant Republic. By the time religious freedom was proclaimed at the late-18th century there were four small hidden churches in the city. 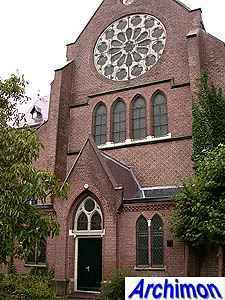 In 1856 it was decided that two of these would be closed while the other two were each to become the centre of a parish, named St. Laurentius and St. Dominicus respectively. The small hidden churches would be replaced by real ones. Architect Th. 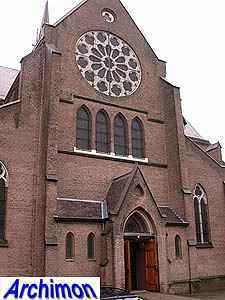 Molkenboer was contacted in 1857 to design a new church for the St. Laurentius parish. 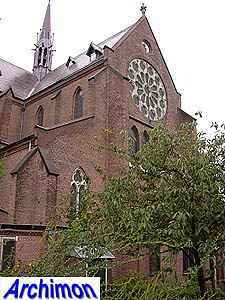 Molkenboer at that time was the most important architect of catholic churches in the western part of the country. 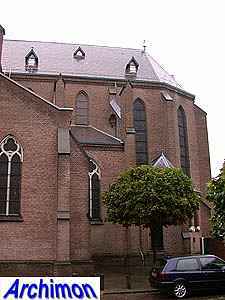 He had made two different designs for the new church. There was however another candidate. P.J.H. Cuypers, whose career had only just started and who hadn't built much outside the southern provinces until then, had also made a design. 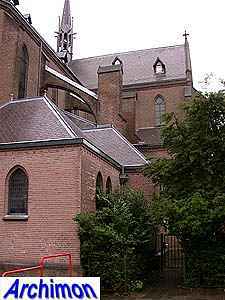 While Molkenboer's designs were in early neo-Gothic style, which meant a mostly decorative use of Gothic shapes, Cuypers' design was based on the Gothic constructional principles as well. Thanks to the recommendation of the catholic writer J.A. Alberdingk Thijm, Cuypers' friend and future brother-in-law, the latter design was chosen. 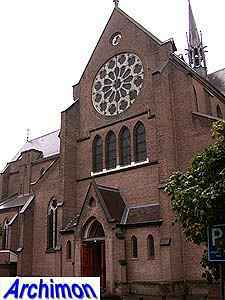 Work on the church started in 1859 and was completed in 1861. 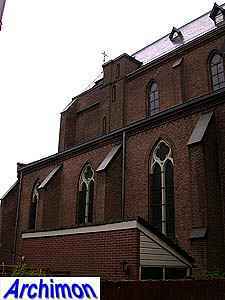 The church is a three-aisled cruciform basilica. 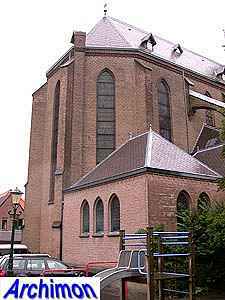 The transept consists of three aisles as well. The choir and the side-aisles have stone vaults; those of the choir are on the outside supported by flying buttresses. The nave has wooden vaults. Many details were executed in marl, a natural stone from Cuypers' native province of Limburg. 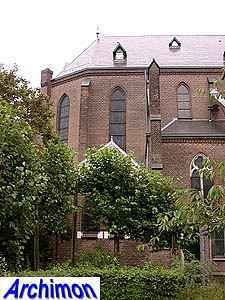 Cuypers' design included a tower, of which only the lower half was built. The government at that time still financed new churches and did not give permission for the tower. A steeple on the tower did get built; this is largely a copy of the one that had been placed on the cathedral in Cologne shortly before. 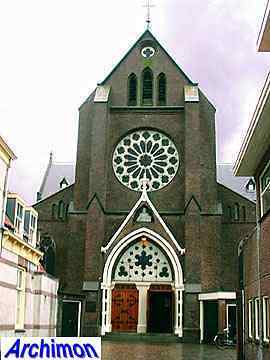 It seems Cuypers' work was appreciated in Alkmaar; in 1863 work began on a second church, the St. Dominicus, a three-aisled cruciform basilica with a square crossing-tower. 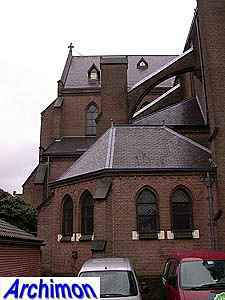 Unfortunately this church was demolished in 1985, and only a stair-turret remains as part of a big shop-building that was built on the location later.